Fanakapan is a London street artist. He started his career in 2000 within the skater culture. At first he worked with five-layered stencils, but soon he found the possibilities of this medium too limited. In 2010, he began to expand his talent and add more media. He created professional props for TV shows and sculptures for prestigious institutions such as the London Aquarium. 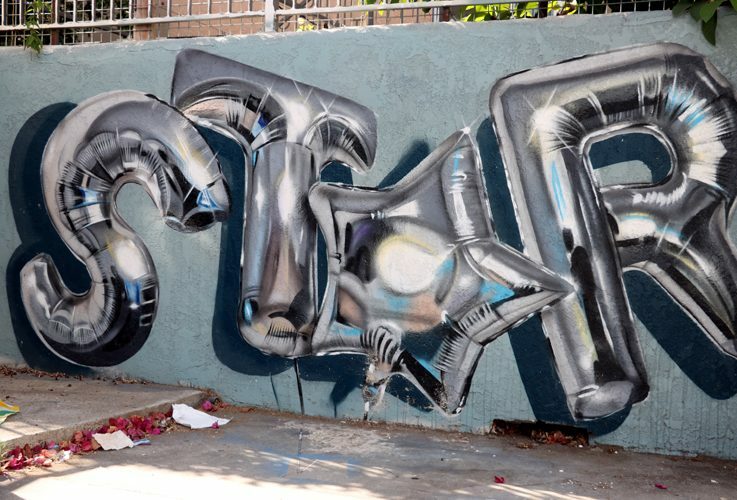 Fanakapan and the HorrorCrew turned to silver letters and other symbols in form of sprayed metallic balloons, giving them more freedom to create light and shadow effects. Since then, they kept improving their art, their hyper realistic works virtually jump into your eye. The light of the shiny surface and the folds of the balloon letters are perfect to create a full 3D effect. Words such as star, shine, fan, rise, paint, creation, deflation and others have appeared on London's walls as well as in some US cities. "Star Mylan Balloon" was created in October 2015 in LA, the word has been varied a few times and can be found in London as the complete word "star" or read backward "rats". In 2016, Fanakapan's work was shown in the "Inflation" exhibition at BSMT Space.